Flanked by Attorney General Claude Walker and Internal Revenue Bureau Director Marvin Pickering, Gov. Kenneth Mapp told reporters Wednesday he is creating a task force to try to collect from delinquent taxpayers. Mapp has authorized the Bureau of Internal Revenue and the Department of Justice to take “robust action” to collect at least 15 percent of what is due before the close of the fiscal year in September. Some non-payers will probably be taken to court, he added. Over the past decade, about $106 million in property taxes and $324 million in gross receipts, corporate income taxes, personal income taxes and other taxes that should have been collected by IRB have remained unpaid, he said. Mapp said it was essential the V.I. Government go after the “low hanging fruit” of delinquent taxes before borrowing more. 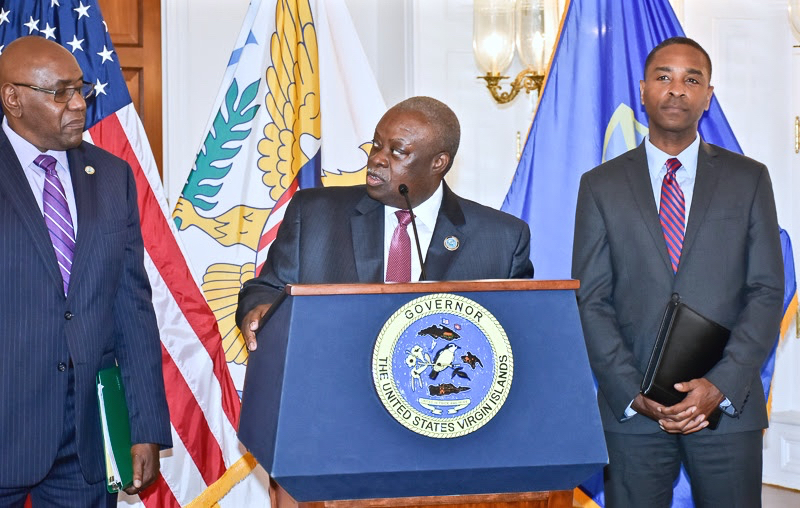 “The $430 million owed to the people of this territory is low hanging fruit and this administration will exercise all of its efforts under the law to make a dent in the collection of these monies,” Mapp said. – Virgin Islands residents or businesses who improperly file returns outside the territory. He said there would be no favoritism and he “doesn’t want to know the names” of those BIR is pursuing. Additional auditors, attorneys and investigators will be assigned to assist in collection efforts. “Every administration has friends who owe taxes and do no have to pay them … this is not one of those administration,” Mapp said. There are a lot of individuals who have entered into payment plans and made one or two payments, then stopped paying, Mapp said. Mapp acknowledged he too has fallen behind on taxes and is repaying. “I still owe the government of the Virgin Islands some money,” he said, adding that it was “a lot less than I owed” initially. “Each and every month I make sure I make good on my payment plan and I see the light at the end of the tunnel that I won’t have to be sending you any more checks,” he said. Walker said there would likely be some prosecutions of tax evaders. “There will be no special letter coming – we all know we have to pay our taxes,” Walker said. “Unfortunately I suspect we will have to prosecute a number of individuals to make it clear it is a new day in the Virgin Islands,” Walker added. Mapp also decried recent legislation he vetoed which would have removed the governor from the process of approving Economic Development Authority tax breaks, arguing there needs to be a check on automatically approving large tax breaks and making sure they actually comply with their hiring and spending requirements. He criticized the way the University of the Virgin Islands Research and Technology Park has removed taxpayers from the rolls without oversight and without evidence of new employment. Mapp said he met with the RTPark director about a year ago, at which time the RTPark had given tax breaks to about 60 entities, including Innovative, Broadband V.I. and Choice. Innovative and Choice are now one company called Viyo. Mapp said he asked how many persons were actually working in the Virgin Islands for companies receiving RTPark tax breaks, not counting those three pre-existing companies. “To date I have not received a report and to date I cannot tell the people of the Virgin Islands how many people in these companies are employed in the U.S. Virgin Islands,” Mapp said. “This is not a way to run a tax exemption program,” he added, saying this sort of concern is what led to federal actions hampering the territory’s EDA tax break program in 2004. To taxpayers awaiting tax refunds, Mapp said he is “confident … by Sept. 30 will pay all the 2015 refunds and will start on the 2016 refunds,” but he cannot say that all the 2016 refunds will be paid immediately, due to the fiscal crisis. Back in 2008, the U.S. Department of the Interior issued a scathing audit report, saying the territory had a “systematic breakdown” resulting in more than $250 million in uncollected taxes from 1998 through 2008. Of that more than $250 million, the report said almost half will probably never be recouped because of the age of the debt. That 2008 report said the BIR failed to identify nearly 20,000 people who weren’t filing taxes, including more than 5,000 government employees. On Wednesday, Mapp also said there were thousands of cases where employers filed tax reports for individual employees or contract employees, but there were no corresponding income tax returns filed. That report also said a past BIR director, apparently Louis “Lolo” Willis, improperly gave tax clearance letters to contractors who owed millions of dollars in back taxes. The Legislature subsequently hired Willis as its executive director. Willis was convicted in 2014 of bribery and extortion involving a number of government contractors doing millions of dollars of work at taxpayer expense. Like Mapp, his predecessor Gov. John deJongh Jr. made several efforts to collect past-due property taxes, including major auctions of property for past-due taxes. Those auctions became mired in controversy when some purchasers conspired to rig the process, resulting in some of the auctions being undone. Reporters were able to call in to the press conference, but the system was set to a “listen only” mode and Mapp only took questions from reporters in the room. Why doesn’t he pay 2015 tax refunds with 2016 tax collections? they need to check people working in IRB who use their positions to defraud the goverment for their selfish gain. Over this past weekend, as I drove through the countryside, seeing so many “unfinished” homes reminded me that houses are not reassessed for property taxes until they are “completed”, as I understand it. Yet, nearly all of these houses “under construction” have remained so while being occupied for many years. Not reassessing a structure until construction is completed, when the structure is occupied, is a joke, and it has created a glut of homes in the territory with rebar sticking our of the top, no paint, and no intention of ever “completing” construction. This is a widely known ploy to avoid paying appropriate property taxes. It needs to end. I certainly understand the concept, and have no issue with it. It makes complete sense. However, once occupation begins, the reassessment should immediately take place and the appropriate property taxes should be assessed and paid, As it stands, all of these “under construction” occupied homes will never pay property taxes for more than a vacant lot. We all know it is wrong, so let’s fix it!